Disclaimer: Completely un-professional and biased views of New Zealand politics from an Outsider. As an American, it's hard not to become disheartened by politics, especially in today's Trump era. But observing New Zealand's 2017 general election for Prime Minister was a breath of fresh air and made me appreciate, even more so, the benefits of living on an island with only 4.6 million people where an ego-maniac isn't running the country. 2. We can think differently and still be friends! As we drew closer to election day, the political chats at home and around the water cooler became more involved (a bit)... what I found surprising was that most Kiwis were NOT overly-opinionated. Granted, American politics is quite polarising due to the extreme nature of some of our leaders, but in New Zealand, they are more middle-of-the-road folk. In my social circle, my closest friends lean towards numerous parties and it's ok! Quite a few romantic couples voted completely differently... I appreciate that believing in the agenda of one party doesn't have to offend or degrade another - unlike how many Americans feel about Republican or Democratic affiliations... did I block many Trump-supporting Facebook "friends?" Maybe. But, in New Zealand, I didn't have to consider it. 3. New Zealanders are more active! Maybe because America's 2016 election result was so shocking and New Zealanders didn't want a similar situation, or maybe because Trump is in a war of words with North Korea and New Zealand could be, literally, in the line of fire... but this year, over 90% of eligible voters were enrolled to vote and more New Zealanders than ever voted early at the polls. 4. Minority Parties get a say! Today I have voted, met a sausage dog, and helped release the Green's Youth Mental Health policy. It may be the best day ever, not least because mental health is a deeply personal issue for me, as it is for many individuals, whānau and friends affected around the country. In government, we will deliver free unlimited counselling services to under 25s, and so much more, with an evidence-based, fully costed policy. We aren't talking about just statistics. We are talking about people's lives. Sure, this is a debatable... and there was discussion about a "wasted vote" but in New Zealand, if you have at least 5% of the votes, you get a seat at the table and can collaborate with other parties to make policies. As a result, a 23 year old lady is the youngest MP in 42 years to sit in Parliament representing the Greens Party - cult favorite for it's environmentalist and pro-Cannabis agenda. 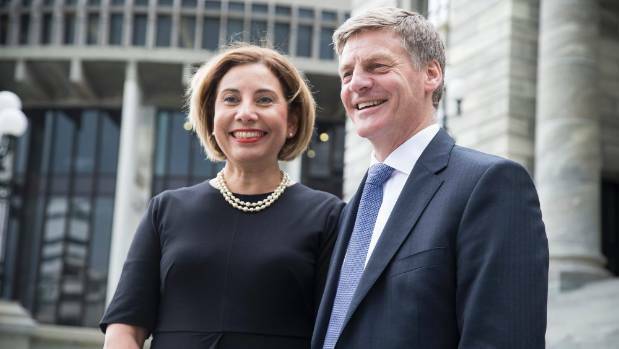 Update: Bill English was the PM, then he wasn't the PM. With votes trickling in a few days later, Labour managed to gain two more seats.Labour nor National could get to 50% of the votes to become the clear leader... the respective parties needed to form a coalition with NZ First (Winston Peters) and Greens Party. As a result, after a few weeks of negotiation, the new government is led by JACINDA ARDEN with the help of Winny and the Greens! When the government reaches a stale mate, it's amazing that it's part of the process to collaborate and compromise to reach a resolution that feels like a win. From what I gather, he's quite conservative - these days, I may becoming a bit more aligned with conservative values as a home-owning DINK (double-income, no kids). I love that he helped to boot NZ's favorite villain, Winston Peters, from the National club over 25 years ago. But mostly, I like the sounds of his wife, Mary English, a beautiful Italian/Samoan doctor who has managed to keep her and her 6 children's lives quite private. When I relate that to the US, we all know the power of a first lady - #MichelleObamaForever. We spent two nights in the little town of Franz Josef. After trying my first snakebite (1/2 cider, 1/2 beer) at the Snakebite brewery, we walked to the Franz Josef glacier. The path is an easy stroll through the exposed river bed that follows the retreating glacier. It's incredible to see how quickly this glacier is moving up the mountains. Franz Josef glacier and Fox glacier are two of three glaciers in the entire world which fall into a rainforest zone (the other is in Patagonia), which makes these glaciers very special to New Zealand and gives them World Heritage status. We walked down the same path of where #FranzJosef glacier is retreating along - mind-blowing to see how far up you need to go to access it versus just 5 years ago. My partner's cousin works the desk for heli-tours and was able to schedule us in for a scenic flight and an ATV tour run by Across Country Quad Bikes the next day. My first time on a helicopter - I was buzzing with adrenaline and couldn't recommend more! We were lucky to fly during a small window of time when the clouds had cleared for a bluebird flight. First time on a helicopter! Epic views of Franz Josepf glacier with @stular 🤗 thanks @kingkatie44 for teeing this up! Shortly after, the clouds rolled in and lingered at the base of the mountains... not great conditions for flying, but completely acceptable for some quad-biking! The tour operator and owner is a Franz Josef local whose family has been in the area for 6 generations. She's completely charming and had some great intel to share on the region (like why the rocks are pink, paradise ducks' romance, and the Maori legend of the Franz Josef glacier). Action packed day. Flight to #FranzJosef glacier, #atv tour through the river and #rainforest, hike to #FoxGlacier and sunset session at Gillespies Beach. During our road trip along the west coast, we were expecting to run into some wild and wet weather. Fortunately, we experienced this for only one day and we were able to still keep the adventurous levels high. 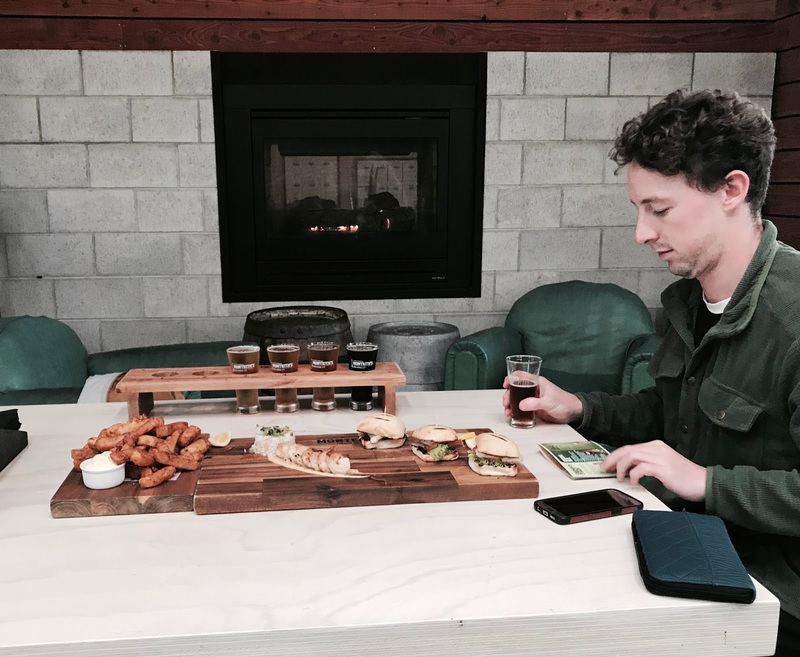 We followed the weather, and planned to spend that drenched day in Punakaiki. 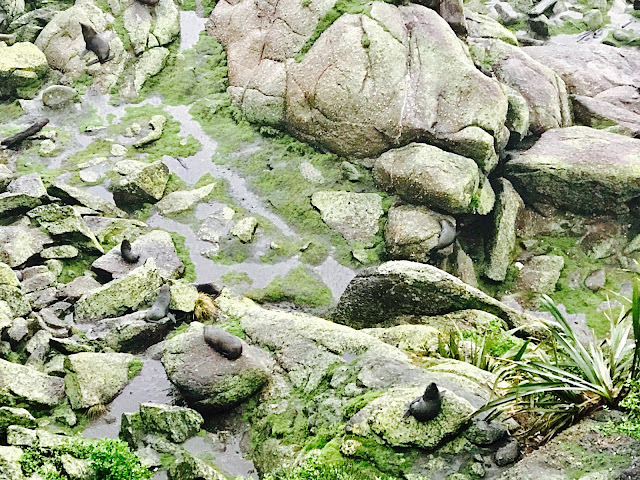 We first stopped just north of Punakaiki to check out the seal colony in Cape Foulwind. This is a short 15 minute walk from the car park. We layered up in our waterproof boots, merino leggings, and rain shells for the torrential downpour. The quick journey was worthwhile because the sea movements and on-shore winds were exhilarating and the seals were hilarious, as always. We then drove to the Paparoa National Park visitor centre which is directly across from the trailhead of the Punakaiki Pancake Rocks and Blowholes. We wandered through the visitor centre and picked up a cute Auckland Zoo & DOC conservation game for my partner's nephew, before grabbing our headlamps and heading to the Punakaiki Caverns. Found a ghost in the #PunakaikiCavern - great exploration and we were sheltered from the wild West Coast weather today. Next up, were the famous Pancake Rocks and Blowholes. We saved this for last so we could see the blowholes during high tide. The swell was large that day and the windy, wet weather made the easy stroll a wild affair. We decided to continue heading south to get closer to Franz Josef where we had a few activities planned. We stopped for an early dinner at the Monteith's Brewery in Greymouth before camping up in Hokitika Gorge. It was a quiet evening, watching the season finale of Game of Thrones off our mobile data. My partner and I set aside time in August to go on a holiday. We considered tropical islands near New Zealand, we thought about going back to southeast Asia, or a road trip in Australia. It took us a little too long to realise that people from all over the world come to New Zealand to have an epic adventure in our own backyard. We agreed to road trip the South Island since neither of us have been to the West Coast. Fate presented herself when my partner's family asked us to do them a favour and drive their motorhome from Auckland to Christchurch. Now we're working on our itinerary, while still remaining flexible dependent on weather. Below is the final outcome. We spent 6 months on the road in our camper van. Hands down, the most inspiring and impressive landscape was found in Wyoming. After driving almost 25,000kms around the USA, we concluded that Wyoming was the biggest highlight of the trip. Tips: Emma Matilda Lakes hike was a bit of an 11 mile let down. No wildlife and similar views were found in our other epic walks. Highlights: Norris campground has a great atmosphere with a trail that takes you to some beautiful geyser activity at Norris Basin. We also woke up to a herd of elk meandering through Mammoth campground which was an awesome sight to see. Tips: Showers available at Mammoth... You can pay $4 at the hotel lobby, or not. No one checks. I also kept my cafeteria cup and enjoyed my free ice tea refills - it's the little things. Check out the thrift store in Gardiner (5 miles from Mammoth) - I purchased a Yellowstone t-shirt and a Patagonia fleece for $2 total! My friend found a wool sweater from Woolrich for 50 cents. Avoid Bridge Bay (and any campgrounds NOT managed by the National Park Service). Overall, Grand Teton NP was my favorite. Every campground is beautiful and unique. The trails are out of this world. I would recommend spending most of your hiking time at this park and letting yourself get lost in the remote Teton ranges or meadows (just don't forget the bear spray!) and then going to Yellowstone for the "attractions" such as Old Faithful, the Falls, and geysers. Most of the tourist spots are less than a mile to check out.